Chapter 12 concludes with a “war” on “the remnant” of the good “woman” representing the true church. That “war” began when “the beast” ascended “out of the [metaphoric] bottomless pit” representing post probationary time” (see Revelation 11:7). Why are they called “the remnant of her seed?” Probably because they, through the providence of God, were spared the martyrdom depicted in the fifth seal scenario of Revelation 6:9-11, one of the very last events to occur in world history just before the close of probation. Therefore, the “flood” that was “cast out of the mouth” of the “dragon” (Revelation 12:15) takes place during the first six trumpet scenarios of Revelation 8:7 to 9:21 and 11:7-13. While the events depicted therein seem, in many ways, to depict Satan warring against his own followers while sparing the Saints, this chapter begins by taking us back retrospective to the post probationary “flood” scenario of Revelation 12:14-17 to two major world events that began during probationary time and ending with a preview of the great “test that the people of God must have before they are sealed.” At that time, many of the saints will not survive (see Revelation 6:11, and 20:4), but their blood will become seed to yield a great harvest of souls for God’s kingdom. Verse 1: And I stood upon the sand of the sea, and saw a beast rise up out of the sea, having seven heads and ten horns, and upon his horns ten crowns, and upon his heads the name of blasphemy. The previous “beast” John depicts ascended “out of the bottomless pit” (Revelation 11:7) which was “the angel of the bottomless pit” and according to Revelation 9:11 was named Abbadon or Apollyon. Consequently, the dragon was forced to use a different approach. 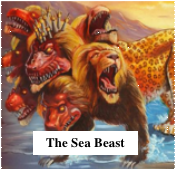 Thus we see the arrival of a different multiheaded “beast” coming “up out of the sea.” That “sea,” in contrast to the “sea” from which the “fourth beast” arose which was troubled by “the four winds of the heaven” which “strove” upon it (Daniel 7:2), appears untroubled, even calm. This is significant because it parallels the arrival of the “vile person” who came “in peaceably, and obtain[ed] the kingdom by flatteries” (Daniel 11:21) instead of armed conquest. While the significance of the seven heads (explained later in chapter 17), and the “ten horns” (also explained later in chapter 18) is somewhat ambiguous at this point, the “name of blasphemy” on its seven “heads” is readily understandable as the hypocritical, slanderous attempt to usurp the prerogatives of God in heaven. In contrast, the single headed “forth beast” was unhypocritically pagan. It denied the existence of the true God altogether, and worshiped idols and even emperors themselves as “Gods.” Although the “fourth beast” also ruled in religious matters, religion, to it, was only secondary to its primary ambition—that of retaining political power. In contrast, religion, in the mind of the sea beast, was primary. Dominance in civil matters, was only a means to an end. 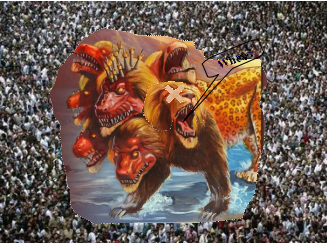 Verse 2: And the beast which I saw was like unto a leopard, and his feet were as the feet of a bear, and his mouth as the mouth of a lion: and the dragon gave him his power, and his seat, and great authority. Even though the dragon was the beast’s designer, he did not wish it to be readily identified as his creation. Although it features the characteristics of the leopard, bear, and lion, it was colorless unlike the dragon which is “red” (Revelation 12:3). Such an omission suggests the devil’s attempt to disguise the beast’s true identity in order to snare the unwary. While the “fourth beast” of Daniel 7 was unlike any other animal Daniel had ever seen, this one that John saw, bore similarities to all three of the animals Daniel had seen except for the fourth. Its primary characteristic, because it is listed first, was “like unto a leopard,” an animal noted for swiftness, stealth and secrecy like the “vile person” who came in peaceably, and obtain[ed] the kingdom by flatteries”(Daniel 11:21). Its bear-like “feet” suggest the “wonderfully” destructive “power” of the “king of fierce countenance” (Daniel 8:23). Then, its lion-like “mouth” is like the “mouth” of the “little horn” power who “magnified himself even to the prince of the host”[Daniel 8:11] and “shall speak great words against the most High, and shall wear out the saints of the most High, and think to change times and laws” (Daniel 7:25) merely because he had “a mouth speaking great things” (Daniel 7:8) that intimidated people who believed what he said, not what God said. Verse 3: And I saw one of his heads as it were wounded to death; and his deadly wound was healed: and all the world wondered after the beast. 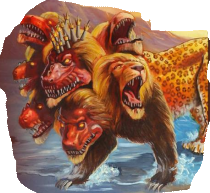 Interestingly, the number of heads possessed by Daniel’s four beasts amounts to seven, the same number possessed by this “sea beast.” Even though only one was “wounded to death,” we are not told which, probably because it does not matter. Consequently, this implies that the “sea beast” is indestructible by any human means. It is only when “the judgment shall sit” and the decision made as to when “his dominion” will be taken away “to consume and to destroy it unto the end” (Daniel 7:26) or when “his body [is] destroyed, and given to the burning flame” (Daniel 7:11) by God Himself. Then, “he shall be broken without hand” (Daniel 8:25) and “come to his end, and none shall help him” (Daniel 11:45). Therefore, his existence will continue until it is destroyed along with the other nations when “the stone [that] was cut out of the mountain without hands” strikes the “great image” of Daniel 2 on its “feet” (Daniel 2:34) at the very end of time. But, in the meantime, “his deadly wound was healed.” That is exactly what happened to the “vile person” after being destroyed by “they that [fed] of the portion of his meat.” But, miraculously, he returned “into his land . . . to his own land” after being “grieved” by “the ships of Chittim” and finally having “intelligence with them that for[sook] the holy covenant.” (Daniel 11:30). Verse 4: And they worshipped the dragon which gave power unto the beast: and they worshipped the beast, saying, Who is like unto the beast? who is able to make war with him? The definition of “dragon” worship is paganism. The definition of “beast” worship is cultism, the worship of a man in place of God. Either way, it is the “dragon” that gets worshipped, not God. The pagan adherents of the “dragon” “worship devils, and idols of gold, and silver, and of brass, and stone, and of wood: which neither can see, nor hear, nor walk” and see virtue in murders . . . sorceries . . . fornication” and “thefts” (Revelation 9:20, 21). They are represented by the “pale horse” icon whose “name that sat on him was Death, and Hell followed with him” (Revelation 6:8). Those who “worshipped the beast” are members of the synagogue of Satan, which say they are Jews and are not but do lie” (Revelation 3:9; 2:9). They are represented by the red horse icon whose rider takes “peace from the earth, and” they “kill one another” (Revelation 6:4). Therefore, both parties represented by the pale and red horses all “worship the dragon,” the pagan overtly and the false professors, inadvertently. Why do the worshipers of the “beast,” ask “Who is like . . . the beast? and “who is able to make war with him? Evidently, because of a possible threat. This implies that that the “beast” power has become a superpower politically and militarily, and none dare oppose it. Verse 5: And there was given unto him a mouth speaking great things and blasphemies; and power was given unto him to continue forty and two months. This is still the “beast” power, who, when he was just “another little horn,” had “eyes like the eyes of man, and a mouth speaking great things” (Daniel 7:8) but, his “look was more stout than his fellows” (Daniel 7:20). Even though his “power” was “mighty,” it was “not . . . his own power” (Daniel 8:24), rather, by virtue of his big “mouth” and “stout . . . look” he intimidated other powers causing them to fight his battles which made him very “strong with a small people” (Daniel 11:23). Because of all those parallels in the book of Daniel, there is little question this “beast” represents the papacy. And, we are told, “power was given . . . him to continue forty and two months,” the same terminology used in Revelation 11:2 denoting the time “the holy city” is “tread under foot forty and two months” which amounts to the same 1260 of Revelation 12:6, 14; 11:2,3; Daniel 12:7 and 7:25. Those, coupled with the final “week” of Daniel 9:27 where the Messiah was crucified “in the midst of the week,” a total of nine 1260’s are referred to. “Some prophecies God has repeated, thus showing that importance must be given to them. The Lord does not repeat things that are of no great consequence.” Therefore, those 1260’s must bear “great consequence,” more even than that of the 2300 “days” of Daniel 8:14 which is mentioned only once. Based on their contexts, we found that the 1260 of Daniel 7:25 is to the historic dark age while that of Daniel 12:7 is future. In that case, the second part of the final “week” of Daniel 9:27 must also bear a future connotation. Then, the context of the two 1260’s of Revelation 11:2, 3 suggests a double application to history and to the future. In Revelation 12:6, the 1260 pertains to the historic dark age while the 1260 of Revelation 12:14 is obviously future. But, how about the “forty and two months” of Revelation 13:5 where “power was given [the beast] to continue forty and two months?” Note, in verse 3, that the “deadly wound was healed.” That sets the context for the following verses including the forty two months of verse 5. Therefore, the “forty and two months” of this chapter is future even though a double application is likely. Note the clause “final fulfillment” suggesting a double or dual application to history as well as the future. Note also “Satan” appearing “as an angel of light . . .” Could that possibly be “Wormwood?” I think so! But, keep in mind that this future time prophecy must be understood as “indefinite time” and cannot be used to establish a definite date for its fulfillment. Verse 6: And he opened his mouth in blasphemy against God, to blaspheme his name, and his tabernacle, and them that dwell in heaven. Here, the “beast” speaks in the “name of blasphemy” seen written “upon his heads” in verse 1. It is the same “blasphemy of them which say they are Jews, and are not, but are the synagogue of Satan” (Revelation 2:9). He is “that man of sin . . . the son of perdition; Who opposeth and exalteth himself above all that is called God, or that is worshipped; so that he as God sitteth in the temple of God, shewing himself that he is God” (2 Thessalonians 2:3, 4). He is the “vile person” (Daniel 11:21) who “shall do according to his will; and he shall exalt himself, and magnify himself above every god, and shall speak marvellous things against the God of gods, and shall prosper till the indignation be accomplished” (Daniel 11:36) after “he shall have accomplished to scatter the power of the holy people . . .” (Daniel 12:7). Them “that dwell in heaven” are “the holy people” who are able to “rejoice” even while “Woe” befalls “the inhabiters of the earth” from Satan because “he knoweth that he hath but a short time” (Revelation 12:12). Verse 7: And it was given unto him to make war with the saints, and to overcome them: and power was given him over all kindreds, and tongues, and nations. The “language here is nearly identical to that of Dan.7:21 where ‘The same horn made war with the saints, and prevailed against them’” just before “the Ancient of days came, and judgment was given to the saints” in verse 22 which is the investigative judgment scene of verses 9, 10 and 13. Therefore, that “war with the saints” took place during the dark ages of history. But, according to verse 3 of this chapter, this “war” takes place after the “deadly wound was healed.” Therefore, we are looking at some things that have not yet happened even though there are obvious similarities to the historic dark age. Consequently, Daniel 12:7 where the “vile person” “shall have accomplished to scatter the power of the holy people” appears to be a more complete parallel to this future “war with the saints” who will again be “overcome” in the future dark age. The post probationary extension to that probationary scenario is found in Revelation 11:7 where the final “war” was waged against the “two witnesses” (after “they shall have finished their testimony” ) by “the beast that ascendeth out of the bottomless pit” of post probationary time. Then, they were “overcome . . . and kill[ed]” with “their dead bodies” being left “in the street of the great city, which spiritually is called Sodom and Egypt, where also our Lord was crucified” (Revelation 11:8) during the three and a half day victory celebration (Revelation 11:8-11), the final “heyday” for the beast’s followers. 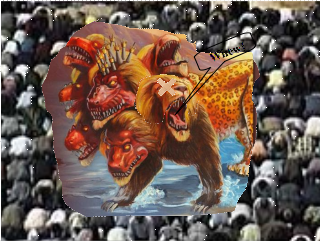 Then, there was “a great earthquakc” in which “seven thousand” of those “men” “were slain” spreading terror throughout the ranks of the “remnant” (Revelation 11:13) of the beast’s followers. So, although the “beast” will have “power . . . given him over all kindreds, and tongues, and nations,” it will be very short lived. Verse 8: And all that dwell upon the earth shall worship him, whose names are not written in the book of life of the Lamb slain from the foundation of the world. Although verse 4 appears to depict two camps of Satan worshipers inclusive of those who worship the “dragon” while others worship the “beast,” they really comprise only one camp, because all worship the “dragon” which gave the “beast” “his power . . . seat and great authority.” Only those “whose names are . . . in the book of life” will be spared, because Jesus promised: “He that overcometh, the same shall be clothed in white raiment; and I will not blot out his name out of the book of life, but I will confess his name before my Father, and before his angels” (Revelation 3:5). 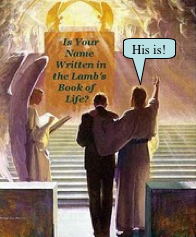 Although everyone whose “names [were] written in the book of life” were members of the human race on the earth, they dwelt in heaven spiritually when they accepted Jesus Christ who made sure their names were transferred from the book of records to the book of life. Verse 9: If any man have an ear, let him hear. Verse 10: He that leadeth into captivity shall go into captivity: he that killeth with the sword must be killed with the sword. Here is the patience and the faith of the saints. According to the Commentary: “A partial fulfillment of this may be seen in the capture and exile of the pope in 1798” implying that the complete fulfillment is yet future. That brings to mind that “This entire chapter is a revelation of what will surely take place.” Even though its “deadly wound” is well on the way to complete healing, “his body [will yet be] destroyed, and given to the burning flame” even while “the rest of the beasts” will live on “for a season and time” (Daniel 7:11, 12). Verse 11: And I beheld another beast coming up out of the earth; and he had two horns like a lamb, and he spake as a dragon. The “horns” of both beasts, represent its power and authority. While the crowned horns of the sea beast suggest the power and authority of worldly rulers who value power and authority for its own sake irrespective of the needs of the people under its dominion, the lamb-like horns of the earth beast suggest its power and authority is beneficent and attuned to the well being of its subjects. So, the separation of church and state is a freedom we have now been enjoying as a nation for more than 230 years. That seems like a long time to us, but, far shorter than the 1500 year life span of the sea beast whose “heads” being covered with “the name of blasphemy” (verse 1), detests the separation of church and state. Unfortunately, the earth beast’s mouth, utters the words of “a dragon” the same animal that gave the sea beast its “power . . . seat, and great authority” (verse 2) which do not harmonize with the beneficence of its lamb-like horns. Such disharmony implies it will violate the principles represented by its horns the greatest of which is the separation of church and state. 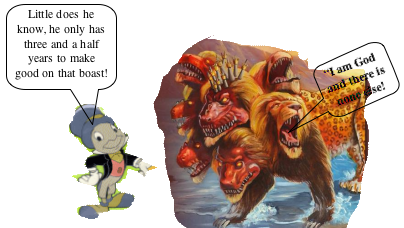 This is the same scenario depicted in Daniel 11:21, 30 where the “vile person” (represented by the sea beast) “shall . . . return, and have intelligence with them that forsake the holy covenant.” The foresakers can be seen to be represented by the earth beast and the “holy covenant” the sacred principles of Protestantism. Verse 12: And he exerciseth all the power of the first beast before him, and causeth the earth and them which dwell therein to worship the first beast, whose deadly wound was healed. Together with the “arms” representing the military might of the foresakers,” “shall pollute the sanctuary of strength, and they shall take away the daily . . . and they shall place the abomination that maketh desolate” (Daniel 11:31). That confederation between the “vile person” and the foresakers which will bring healing to the “deadly wound” of the sea beast alluded to in verses 3 and 12 of this chapter and the destruction suffered by the “vile person” in Daniel 11:26. Note the word “earth” in this verse in which all “which dwell therein” are predicted to “worship the first beast.” While “earth” in verse 11 denotes the place of the sea beast’s origin, “earth” in this context depicts “all the world” (verse 3) not just the United States. Looking further, this governmental betrayal of its trust will be the signal that “the hour of temptation, which shall come upon all the world, to try them which dwell upon the earth” (Revelation 3:10) will have arrived. It will also be the time when the “fifth seal” (Revelation 6:9-11) representing the “test that the people of God must have before they are sealed,” has been “opened.” Therefore, America, controlled by “them that forsake the holy covenant,” will become Satan’s primary tool in committing “the abomination that maketh desolate” (see Daniel 11:30, 31 and 12:11). This verse, and the following, depict the activities of the promoters of sea beast worship. They will be obliged to stage spectacular demonstrations of some kind in order to win support from a reluctant populace who would distain having religion forced upon them. 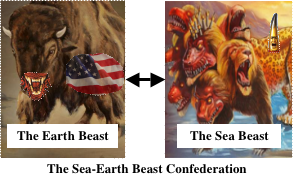 Only time will reveal the sequence of events and movements that will lead up to the actual implementation of sea beast worship. But, these “great wonders” with actual “fire” coming “down from heaven” at the literal command of its promoters will not fail to dazzle the senses and benumb the questioning mind. The pronoun “he” in this verse is indicative of some of the things the “earth beast” magicians will perform. Such a fiery scenario will be much like that conducted by Elijah who, bidden by God, gathered the people on mount Carmel challenging them to worship “the God that answereth by fire, let him be God. . . then the fire of the Lord fell . . . And when all the people saw it, they fell on their faces: and they said, The Lord, he is God; the Lord he is God” (1 Kings 18:24, 38, 40). In that case, God was the source of the “fire.” In this case, Satan will be the source even though from all unaided sensory evidence, it will look like an act of God. Verse 14: And deceiveth them that dwell on the earth by the means of those miracles which he had power to do in the sight of the beast; saying to them that dwell on the earth, that they should make an image to the beast, which had the wound by a sword, and did live. Doubtless, these wonders will be subjected to intense, scientific scrutiny in the attempt to prove them a fake, but will, instead, prove them to be genuine. Consequently, all “them that dwell on the earth” will be deceived into believing this to be a manifestation of God Himself, little knowing it lays the groundwork for the greatest deception of all time when “Wormwood,” the false Christ, will make his appearance soon after the close of probation. The similarity of these fiery miracles to Elijah’s is inescapable and we can be assured the agents of Satan will capitalize on that making it almost certain those who believe all miracles are from God will be deceived. While to the world, the teachings of the book of Revelation are “mystical and unintelligible,” the saints know they are “definite.” They comprise a clear, reliable guide that will take them through the confusing mysteries of the future time of trouble just before them. Evidently, the “great wonders” and “miracles” depicted will be preceded by a “grass roots” movement insisting that a religious law be instituted. Such a law will be tantamount to repudiating the first amendment of the Constitution that says: “Congress shall make no law respecting the establishment of religion or prohibiting the free exercise thereof,” with the second clause being its target. That suggests those who favor such a movement will feel threatened by those who wish to prohibit “the free exercise” of religion a polarity in the political spectrum that the founding fathers of our government wished to prevent at all cost. The only possible way to prevent such a development is the separation of church and state. Verse 15: And he had power to give life unto the image of the beast, that the image of the beast should both speak, and cause that as many as would not worship the image of the beast should be killed. With “he” being the “earth beast” representing the United States, giving “life” to “the image” must represent a legislative mandate requiring capitol punishment for refusing to worship in the manner dictated. That will be an “establishment of religion,” an act forbidden by the first amendment of the Constitution. It will be a renunciation of all that the forefathers of this marvelous country stood for. They wanted nothing more but to worship or not to worship in a manner according to the conscience of each person individually. But, there is a silver lining to the black cloud of oppression portrayed in these verses. John saw “the souls of them that were beheaded for the witness of Jesus, and for the word of God, and which had not worshipped the beast, neither his image, neither had received his mark upon their foreheads, or in their hands.” While earthly authorities will condemn them and commit them to the headsmen’s axe, God will reward them by having them reign with Him for “a thousand years” (Revelation 20:4). By that time, every principle of the Constitution shall have been repudiated because, like any system of laws and regulation, if one link is broken, the whole system collapses. That will be “the test that the people of God must have before they are sealed.” Whether they live or die, all will be faced with the specter of execution at the hands of a government that once protected their rights. Another aspect of the earth beast’s “power to give life unto the image of the beast” should be considered. The word “life” is from the Greek word “pneuma,” often translated “spirit,” either holy or evil. In this case, it clearly represents an evil spirit, the institution of Spiritualism. 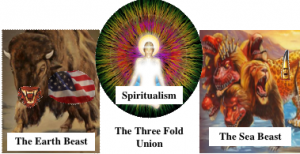 “Spiritualism is about to take the world captive. There are many who think that Spiritualism is upheld through trickery and imposture; but this is far from the truth. Superhuman power is working in a variety of ways, and few have any idea as to what will be the manifestations of Spiritualism in the future.” So, “spiritualism” will be the source of power for the “miracles which” the earth beast will have “power to do” in verse 14. This is the first of the eight times a “mark” is depicted in the book of Revelation. It will give objective evidence that the bearer has complied with the earth beast’s demand to worship the “sea beast” whose “deadly wound was healed.” Since all, “both small and great, rich and poor, free and bond” are required to receive it, there will be no neutral ground. All will be under this obligation called “the abomination that maketh desolate” in Daniel 11:31 and 12:11. A quick review of verses 12-15 depict the miraculous means by which the “image” becomes an established fact in the minds of all earth dwellers regardless of social status. The “miracles” spoken of, will produce something like a mass hysteria crying for an identification “mark” to facilitate the distinction between all who refuse compliance and those who comply. It will be introduced first in America where “rulers and legislators, in order to secure public favor will yield to the popular demand . . .” for the “mark.” Evidently, the american “public” will be more than ready for the government to repudiate one of the most important restrictions mandated by the first amendment of the Constitution stipulating that “Congress shall make no law respecting an establishment of religion . . .” As a result, the “free exercise” of religion will be prohibited, “the freedom of speech” abridged and even “the right of the people peaceably to assemble and to petition the Government for a redress grievances” will be compromised. Therefore, this “mark,” characterizing the speech of “a dragon” (see verse 11), will be a devastating blow to the integrity of the entire Constitution. So, what is the “mark?” Going back to the book of Daniel, we have already found that the parallel to the “sea beast” is the “vile person” of Daniel 11:21. He, together with “them that forsake the holy covenant” represented by the two horned “beast” of Revelation 13:11, together “place the abomination that maketh desolate” (see Daniel 11:30, 31). We also found that the “vile person” of Daniel 11:21 is parallel to the “little horn” and “king of fierce countenance” of Daniel 7:8, 8:9 and 23-25 who “shall also stand up against the Prince of princes (Daniel 8:25)” by changing the “times and laws” of God (Daniel 7:25), particularly the fourth commandment by instituting Sunday worship. 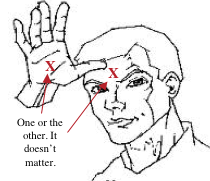 It seems clear, therefore, that the “mark” coincides with “the abomination that maketh desolate” depicted in Daniel 11:31 and 12:11. It will subject “the people that do know their God” to “sword . . . flame . . . captivity, and spoil, many days” (Daniel 11:32, 33). But, “Blessed is he that waiteth, and cometh to the thousand three hundred and five and thirty days” sometime after “the abomination that maketh desolate [is] set up” (Daniel 12:11, 12). Verse 17: And that no man might buy or sell, save he that had the mark, or the name of the beast, or the number of his name. Economic sanction (or boycott) is often employed as an alternative to open warfare by one nation against another to force compliance, but, it has never been used against individuals because of the logistical difficulties associated with individual identification. But, today, with the advent of computer technology, that difficulty no longer exists. It only awaits the consensus of the populace who come to believe the false assumption God would be pleased with forced compliance. Therefore, the legislators and politicians themselves will not share the greatest blame for this abomination. 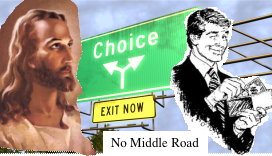 Rather, it will be a manifestation of the “basic impulse” of the “religious zealot and the theocrat” who will move the people to adopt their viewpoint because of the perceived threat from “the totalitarian atheist” who aspire “to a society in which the exercise of religion has no place.” The delicate balance between the “establishment” and the “free exercise” clause of the first amendment of the Constitution will, evidently be swung totally in favor of the “establishment” clause. Note the relationship between the “mark, name” and “number” suggesting all are one and the same. Verse 18: Here is wisdom. Let him that hath understanding count the number of the beast: for it is the number of a man; and his number is Six hundred threescore and six. Although the words “six hundred threescore and six” is the bases of much vain speculation,” “those who wish to know the meaning of the cryptic number may understand” as John says here. Although nothing about “666” is found in the Spirit of Prophecy, the Commentary presents a very good, common sense discussion. Another explanation, based on the context, not only of chapter 13, but also chapter 16, could be adopted. Although I have no “textual evidence” to cite for the possible omission of the indefinite article “a” in “the number of a man,” if the omission were allowed it would read: “for it is the number of man” suggesting the cultic mentality of the “sea beast” which is probably the most powerful cult in the world in view of its excessive admiration, even adoration of the pope. 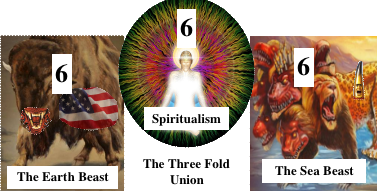 As noted in our discussion under verse 17 where “the mark, name” and “number” of the beast indicate “degrees of affiliation” with the “number” 666 representing the most profound affiliation, the three “6’s” could well represent the cult of the “threefold union” of Catholicism, affiliated with apostate Protestantism” and Spiritualism. Just such a cult is spelled out in Revelation 16:13, 14 where John “saw three unclean spirits like frogs come out of the mouth of the dragon (Spiritualism), and out of the mouth of the beast (Catholicism), and out of the mouth of the false prophet (apostate Protestantism). For they are the spirits of devils, working miracles, which go forth unto the kings of the earth and of the whole world, to gather them to the battle of that great day of God Almighty,” the very same scenario depicted in chapter 13. Consequently, the numbers “666” could very will represent the “false trinity” that is rapidly taking shape right now before our very eyes! Note that the metaphoric “bottomless pit” is depicted seven times in Revelation 9:1, 2, 11; 11:7; 17:8; 20:1, 3. For a definition, some rely heavily on this quote: “That the expression, “bottomless pit,” represents the earth in a state of confusion and darkness, is evident from other scriptures. Concerning the condition of the earth ‘in the beginning,’ the Bible record says that it ‘was without form, and void; and darkness was upon the face of the deep. . . .’ Prophecy teaches that it will be brought back, partially, at least, to this condition. . . . Here is to be the home of Satan with his evil angels for a thousand years.” (Great Controversy pages 658, 658) That definition is well suited for Revelation 20:1, 3 where Satan and his angels roam the earth alone for a millennium without any living human beings to tempt or molest on the earth. But, that definition does not satisfy what we find in Revelation 9:1, 2, 11; 11:7 and 17:8 where the wicked are still alive! For example, in Revelation 9:4-6, “those men which have not the seal of God in their foreheads” live in agonizing pain for “five months” and long for “death, and shall not find it, and shall desire to die, and death shall flee from them” after Abaddon who was “given the key of the bottomless pit” (Revelation 9:1, 2, 11) had opened it. The only satisfactory definition, in my mind, is that the “bottomless pit” is a metaphor for post probationary time, the events that follow the casting down of the censer in Revelation 8:5 and the release of the “four winds of the earth” of Revelation 7:1. As noted in our study of chapter 12, the 500 years after the “man child “was caught up unto God,” does not include the “war upon Christ and His people during the first centuries of the Christian era” when “the Roman empire, in which paganism was the prevailing religion” was represented by “the dragon” which “primarily, represents Satan” but “in a secondary sense, a symbol of pagan Rome.” (Great Controversy 438) So, in this study, it is well to revert back to the book of Daniel to fill in the 500 year gap. Note: this “beast” merely arose “up out of the sea” which we can assume was undisturbed. the “lion = 1 head; the “bear” = 1 head; the “leopard” = 4 heads; the “fourth beast” = 1 head = 7 heads. 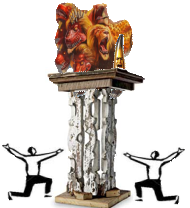 “worshipped” from: “proskuneo” (Strong’s #4352) “To kiss the hand to [towards] one, in token of reverence, fall upon the kinees and touch the ground with the forehead as an expression of profound reverence; kneeling or prostration to do homage or make obeisance” etc. Please remember, all these future time periods must be considered “indefinite time.” Mrs. White used the term “definite time” repeatedly in her writings [more than 80 times according to the CDROM]. Careful examination will prove that “definite time” means “time setting.” So, while the evidence for a future application of these time periods is nearly overwhelming, we will be unable to set a date for their beginnings prospectively, only retrospectively, most likely sometime after the close of probation when the trumpet scenarios commence. Also, note this quote which should not be forgotten: “’Power was given unto him to continue forty and two months.’ And, says the prophet, ‘I saw one of his heads as it were wounded to death.’ And again: ‘He that leadeth into captivity shall go into captivity: he that killeth with the sword must be killed with the sword.’ The forty and two months are the same as the ‘time and times and the dividing of time,’ three years and a half, or 1260 days, of Daniel 7– the time during which the papal power was to oppress God’s people. This period, as stated in preceding chapters, began with the supremacy of the papacy, A.D. 538, and terminated in 1798. At that time the pope was made captive by the French army, the papal power received its deadly wound, and the prediction was fulfilled, ‘He that leadeth into captivity shall go into captivity.’” That statement lumps Revelation 13:5, 10; 11:2, 3; and Daniel 7:25 all together in the past. But, in light of her other statements, already referred to, we must acknowledge that the future applications also receive full support from the Spirit of Prophecy. If we can find it in our hearts to accept that concept, it will clarify many difficult, even impossible exegetical problems in the understanding of Daniel and Revelation that have faced our church for more than a century! “life” from “pneuma” (Strong’s #4151) “Spiirt” x 111; “Holy Ghost” x 89; “Spirit (of God)” x 13; “Spirit (of the Lord)” x 5; (My) Spirit” x 3; “Spirit (of truth)” x 3; “Spirit (of Christ)” x 2; “human (spirit) x 49: (evil) spirit” x 47; “spirit (general)” x 26”; etc. The Great Controversy, page 592. I omitted the rest of the sentence in order to emphasize the fact that legislators, who will be well aware that such a thing would violate the Constitution, will cave in to pressure from the public. I’m sort of mimicking the phraseology used in the Commentary. Please forgive me if I sound trite. according to the dictionary, one definition of a “cult” is the “extreme or excessive admiration for a person, philosophy of life, or activity.” In this case it would be the “extreme or excessive admiration” of the pope instead of God, or Jesus Christ.